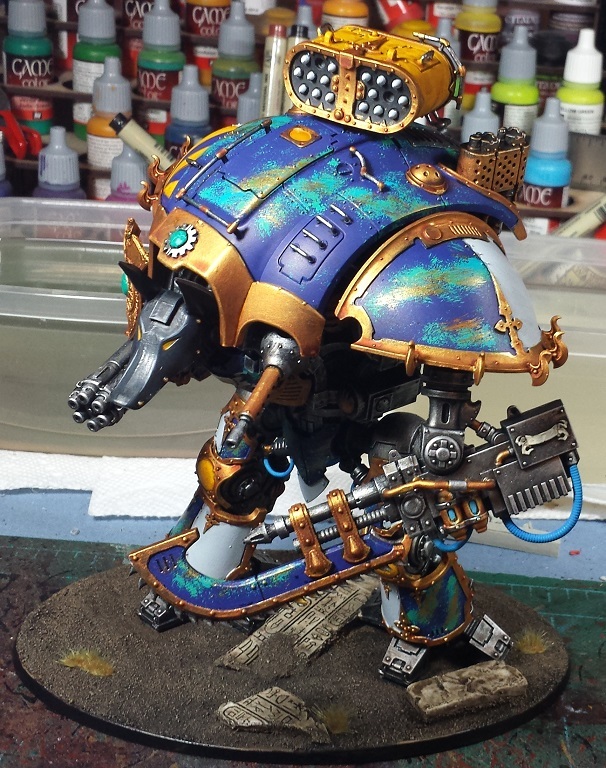 Mordian 7th Regiment: Heresy Era Mechanicum - Knight Warden painting continues! 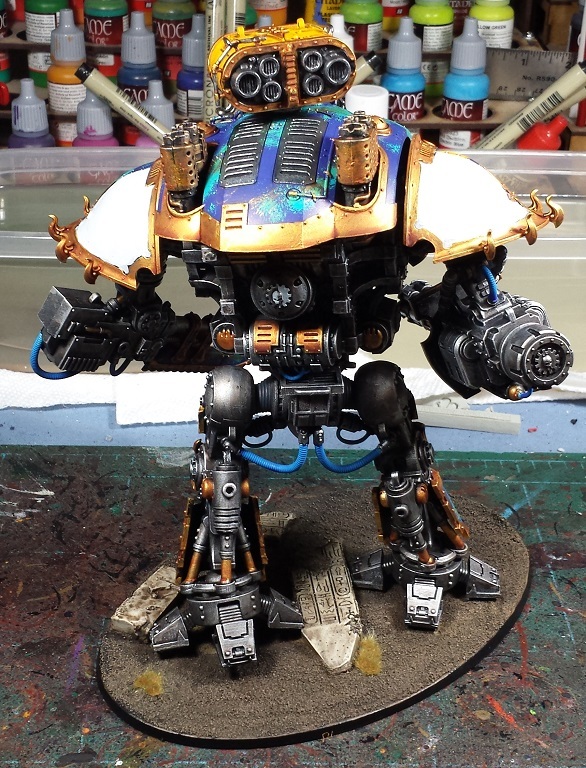 Heresy Era Mechanicum - Knight Warden painting continues! Got a fair bit of brush time in over the weekend and Khenti-Amentiu is starting to come together! I knew up front that I didn't want to go with the crimson, gold and bone that I've been doing (to death) on the Thousand Sons and their Mechanicum allies, so decided that whatever happened, there would be no red on the Knight! After much hemming and hawing I settled on trying my hand at doing a lapis lazuli effect on the armour plating, as that's often associated with Egyptian artistry. I spent a fair bit of time checking out images and did some practicing on a couple pieces of cardstock until I started feeling confident. While it's blown out a little in the pictures, there's actually three different blues and teals sponged on in stripes, then some gold was added as striations. I'm thinking it needs a little more pop, so will likely add in a little white streaking and another pass of a shinier gold here and there. Overall I'm fairly happy with the result but the pictures aren't really doing it justice. Perhaps once it's sealed it'll pop a little more. As spot colors I decided to go with white and yellow - The blue/yellow combo is always nice and Tzeentch-y, and the white should allow any transfers laid onto it to really pop. Went with the 'sunray' theme on one shoulder pad and tried to go for a charcoal/onyx look on the faceplate. Still a lot of little cleanup and detailing to do - I do like to take a couple pictures towards the end of a project as it helps me really see the various things that remain to be done that oddly can be hard to see in-hand. Nevertheless, it's coming along nicely, and think it'll look pretty sharp once I get the initial sealant pass on and start adding transfers and weathering to it! Very cool, that's an effect that I've not seen used on models before and it's really effective! Love it! Oh that is so well executed! Loving that lapis effect. It really adds a supernatural quality. Looks great! Those conversion parts really make he model and set it apart! Very cool man... mixing up the color will also make it stand out! .. the sponge technique came out looking good. That head is ace. Will it stay metal or is going blue meany as well ? And lovely sunburst detail on that shoulder. Looking great! 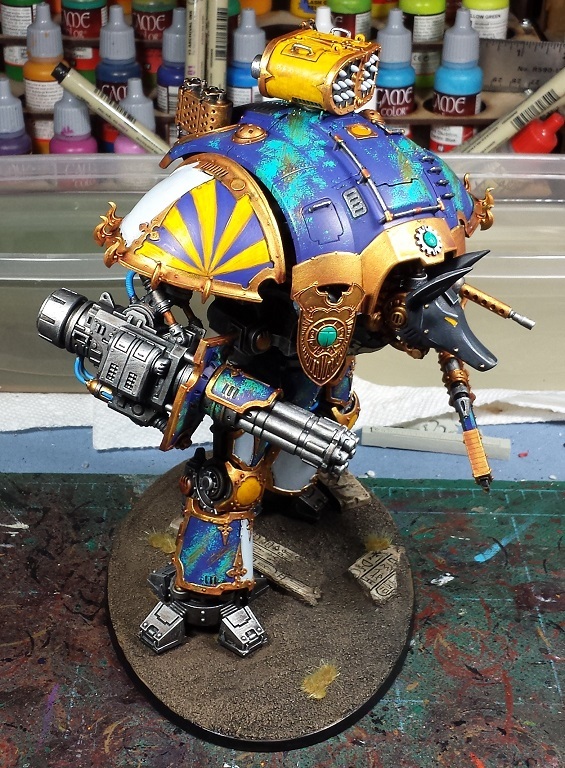 A nice, thematic Knight for your army. Love the blue green clouds effect over the Carapace, that's unique. 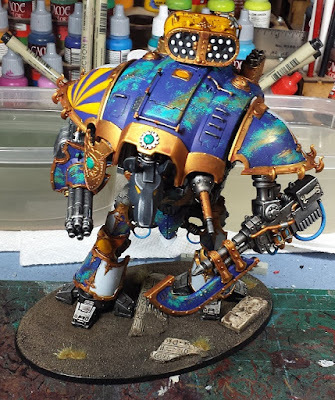 Really like the lapis lazuli effect and the use of 40K Thousand Sons colour scheme in addition to the 3rd party 'Egyptian' parts really links the Knight to the Thousand Sons. Its a different model, surely? You can't possibly have painted it this fast. Its looking pretty awesome whatever you did. @Nick Thrower: Cheers, man - It was experimental but worked out okay! @The GunGrave: Thanks! I didn't need a knight, but as soon as I saw those bits I was hooked! @Todd Sherman: Cheers Todd! Always fun to experiement with other tools! @Siph_Horridus: Thanks! It was fun to do! @Bronislaw Czevak: Cheers! There may be a couple more coming in the future! "Think it'll look pretty sharp"?! It looks amazing already mate! 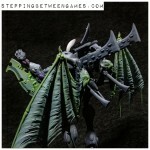 Love the scheme and effects you've worked on and I'm glad you stuck with a traditional black Anubis head. My fav titan of yours to date I think. @Dai: Haha! Thanks very much, man! @Greg Hess: Cheers, Greg! The knight won't be going to NOVA I'm afraid, no room in the travel case for such a big model. As it stands I am bringing about 4000 points of miscellaneous Thousand Sons and Mechanicum though! Amazing work on it! Between the new parts and the colors, he is going to be very striking on the table. Would you mind if I reposted this on my Instagram? Thanks!